The lower one, obviously, is the earlier. I think it may have been taken pre-WWII. The upper one, probably late 40s. 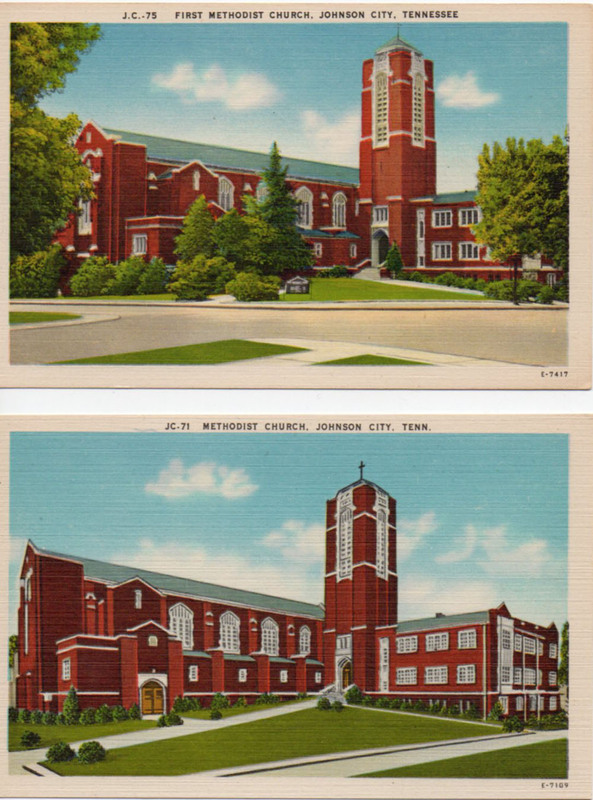 Posted in Existing photo processed by Bob Lawrence and tagged Asheville Post Card Company, First Methodist Church, johnson city tn, Methodist Church, post card, post card comparison. Bookmark the permalink. 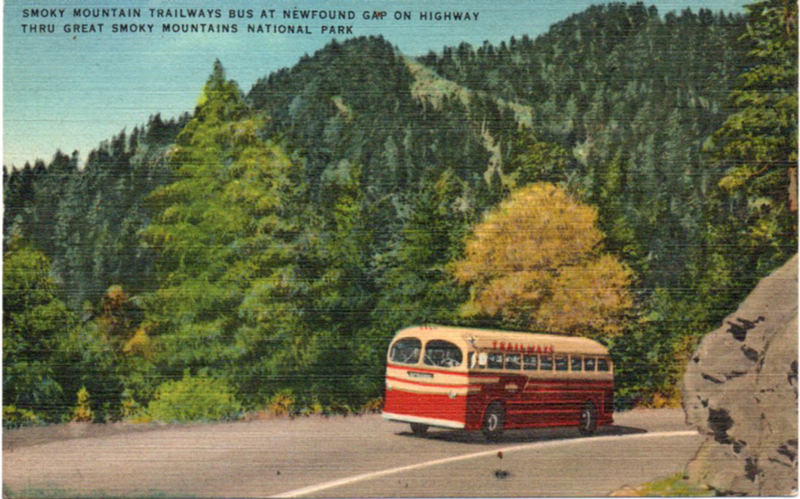 I don’t know squat about pre-WWII buses (or any other buses, for that matter), but I was curious about this Smoky Mountains Trailways bus. By the shape of the windshield, I think it may be a Mack. I welcome a correction on that. The card was printed in the early 40s (Smoky Mountains National Park was dedicated, by FDR, no less, in 1940. I read a posting that stated the “founder of Trailways” had a lodge up in the mountains. I couldn’t track down who that may have been, but there was no real Trailways. It was Trailways Transportation System, comprising five individual companies, that was set up in 1936. Darn nice-looking card, though. Asheville Post Card Company, natch. It’s linen finish, but borderless. I thought it might be a Curt Teich, but that inventory number doesn’t match up (I get a lot of that. APCC used other printers). As I post this, the Smoky Mountains are actually quite smoky from the numerous forest fires we have going on. 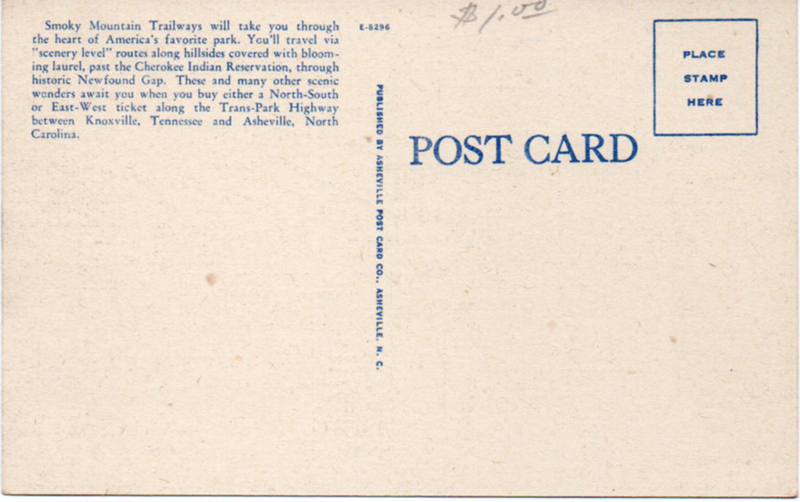 Posted in Bob Lawrence Photography and tagged Asheville Post Card Company, Curt Teich, post card, Smoky Mountain Trailways, Trailways Transportation System. Bookmark the permalink. 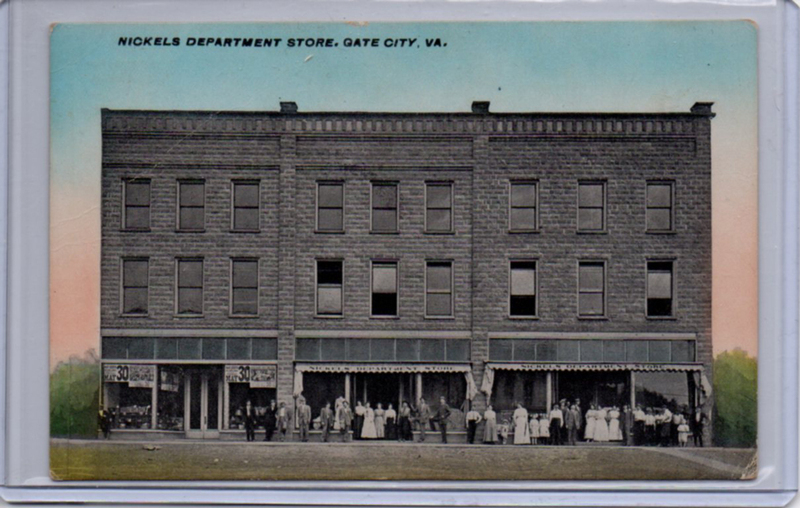 Nickels Department Store, Gate City, VA. The writing is all in pencil. The postmark is double stamped and blurry. The interesting thing is that the card, in the upper left, is dated “Feb. 2, 1912”, but the postmark shows it was mailed on January (something) 1912. Reading on: “Hurry answer soon Hello Hazel how are you by this time I am just fine and having a fine old time tell Bess to send me a card will be home in next month” The author was not big on punctuation. 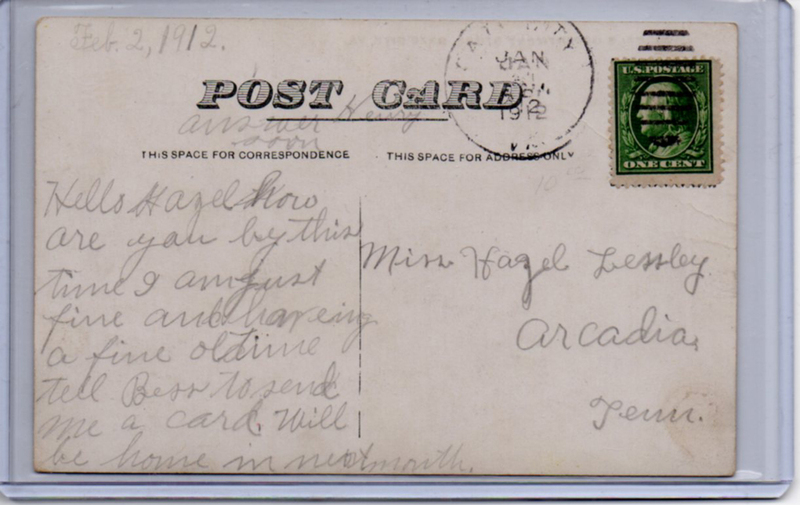 Mailed to Miss Hazel Lessley, Arcadia, Tenn. Arcadia, formerly known as Reedy Creek Settlement, is one of the earliest clumps of humanity along Bloomingdale Road. We always used to call it Bloomingdale Pike (indicating at some time in the past it was a private road…you had to pay to have the pike across the road lifted so you could get through). Anyway, there are 36 men, women and children all lined up across the front. The photo was maybe taken in April or May, since the people aren’t wearing winter clothes and there’s some sign, perhaps a circus sign, in the show window to the left advertising an upcoming May 30 performance. As is common with cards of this vintage, there’s no publisher name shown. There may be an inventory number or other information under the stamp, but I’m not even going to try to steam it off. Posted in Existing photo processed by Bob Lawrence and tagged 1912, Arcadia Tenn, Gate City VA, Nickels Department Store, post card, Reedy Creek Settlement. Bookmark the permalink.